One of the most delightful aspects of the British royal jewelry vaults is the collection earmarked as "heirlooms of the crown" -- jewels designated to be worn by sovereigns and their consorts. 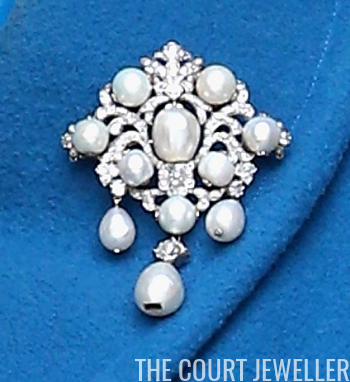 Today's brooch, Queen Victoria's Pearl and Diamond Brooch, is one of those pieces. Leslie Field describes the brooch as "a large diamond-shaped design set with numerous diamonds, eight pearls and three pendant pearl drops," adding that Queen Victoria is the monarch who designated the piece as an heirloom of the crown. Field also notes that "Queen Elizabeth the Queen Mother wore [the brooch] a great deal in the 1950s but it has not been seen in many years." 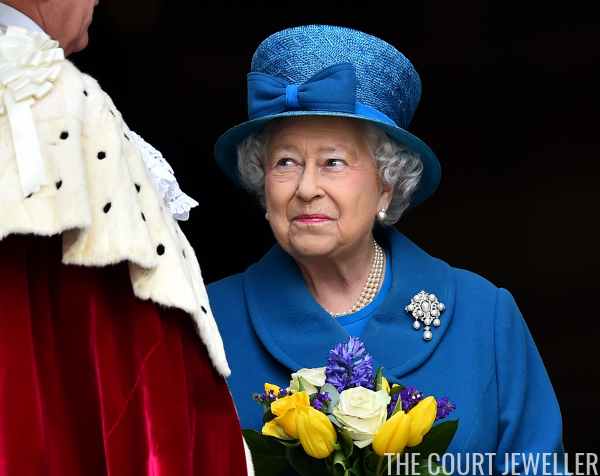 Later in her life, the Queen Mum began wearing the brooch again. Above, she dons it for a visit to the Chelsea Flower Show in 2001. 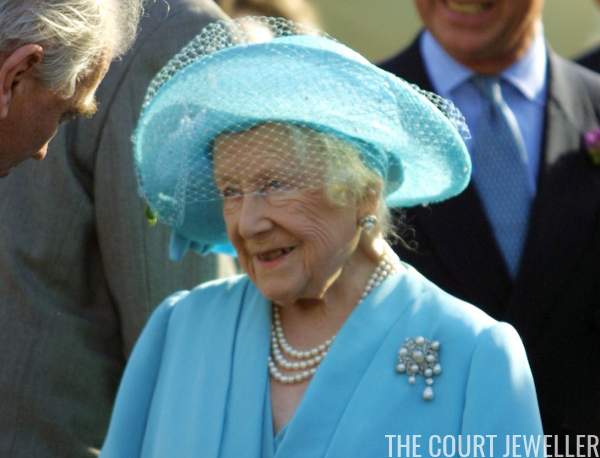 After the Queen Mother's death in 2002, her daughter, Queen Elizabeth II, began wearing the brooch. 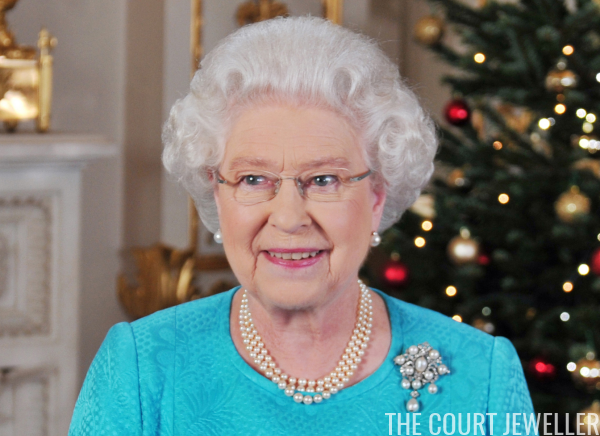 She's chosen it for some high-profile occasions, including the 2009 Christmas Broadcast. 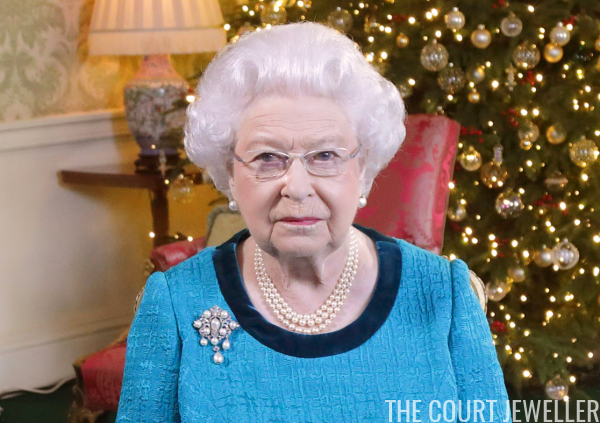 She wore the brooch again for the Christmas Broadcast in 2016. 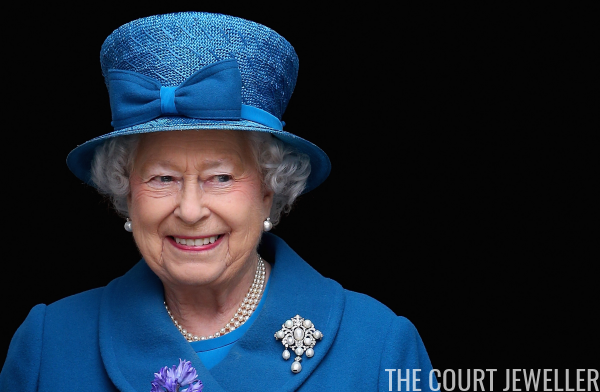 You'll note that the Queen often wears the brooch with blue ensembles, though she has also worn it with other colors, including pink. And in March 2015, she selected the brooch for an important service of commemoration at Westminster Abbey. The service honored British troops stationed in Afghanistan.